Growth numbers for the large players in the sector, though, improved during the quarter. The sector, broadly represented by daily household items such as food and beverages and personal care products, is estimated to grow by 12 per cent (in value terms) and close to 8 per cent by volume in 2018. This will fall short of the previous year’s value growth rate of 14 per cent and volume growth of 10 per cent, data and research firm Nielsen said. “The trade dynamism triggered by demonetisation and the goods and services tax (GST) roll-out has almost settled down. 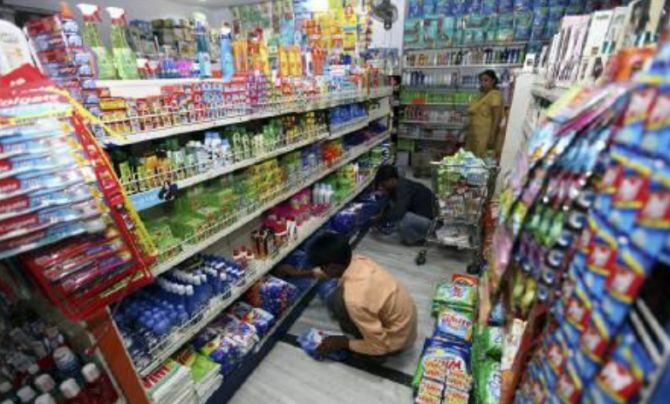 "Retail offtake continued to be buoyant with double-digit growth on the back of tailwinds, such as the GST rate cuts, strengthening macroeconomics, and robust monsoon projections,” Nielsen noted. Take the case for the April-June quarter. Despite an unhindered run since January, the growth rate in the sector stood at 10.9 per cent and its volume grow by 7.6 per cent - much lower than the double digit-growth it observed last year, when lingering effects of demonetisation and the GST roll-out had disrupted businesses. Hindustan Unilever (HUL) and Dabur each posted 16 per cent growth in revenue, backed by volume growth to the tune of 12 per cent and 21 per cent, respectively. During the same quarter last year, revenue growth of HUL was 4.98 per cent; Dabur’s revenue growth had declined 4.4 per cent. Britannia and Marico both grew by over 15 per cent in June. “While growth last year was on a relatively lower base of 2016, in 2018 the base is much higher because of good growth in 2017,” Shukla said. Other industry analysts said slower growth posted by some players and the decimation of non-branded and local players may have dragged the rates down a few notches in 2018. Incremental growth in rural markets, compared to urban areas, continued to rise during the past one year. Both grew at about the same rate after demonetisation as discretionary income nosedived and preparations for the GST meant deadlock in wholesale trade. Now, the rural market is growing at 28 per cent higher than the urban one. Increased focus on large-format stores by retail players, at the local and national level, has helped the distribution channel gain a percentage point since June last year. From 9 per cent last year, now modern trade constitute 10 per cent of the FMCG retailing market - thanks to consumers’ preference for the convenience that it offers. Nielsen also noted that Indian companies are gaining over their multinational counterparts. While in 2016, seven out of the top 10 fastest-growing companies with revenue of over Rs 1000 crore were Indian, now the number has surged to nine.